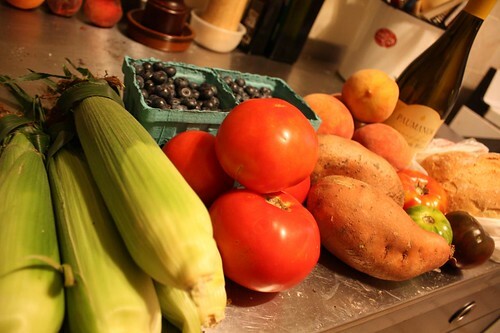 Last week I missed our farm share pickup, a moment of great personal sadness. To fill in I made a trip to the Greenmarket. This week I was able to pick up our farm share, however, I was so impressed by the Greenmarket on 97th Street that I made a trip this week anyway. Considering our farm has been suffering some sort of horrific tomato plague the Greenmarket is a great way to supplement our extremely small share of tomatoes. At the Greenmarket I picked up corn, blueberries, sweet potatoes, beefsteak tomatoes, peaches, and a loaf of sourdough bread from Baker's Bounty. I also got a free sample of heirloom tomatoes from the Heirloom Tomato Company. I'm not great at identifying heirloom tomatoes but let's say the three that I got were a Green Zebra, a Black Brandwine, and a Rose. I'm probably wrong but we will leave it at that. 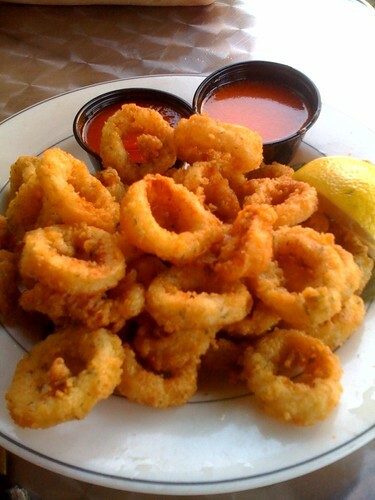 Since it was such a nice night we stopped by Coogan's for some of their Buffalo style calamari and Coogan's ale. 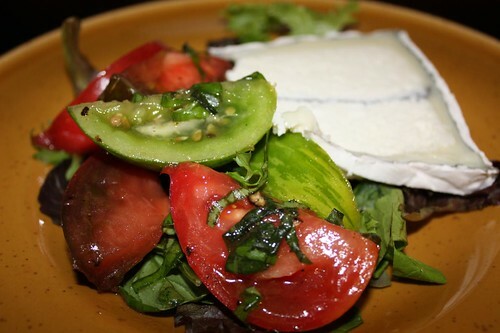 At home I made a salad with the three types of heirloom tomato, basil, and Humbolt Fog cheese. 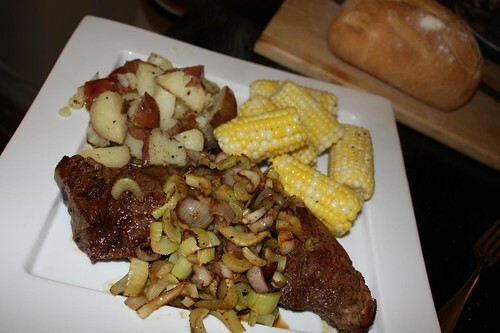 Jen picked up this beautiful sirloin steak which we pan roasted with shallots and celery. We also made some of the corn and potatoes. We were so full that I can't tell if this picture was taken before we started or after we finished eating. No matter. The leftovers will be put to good use this weekend. 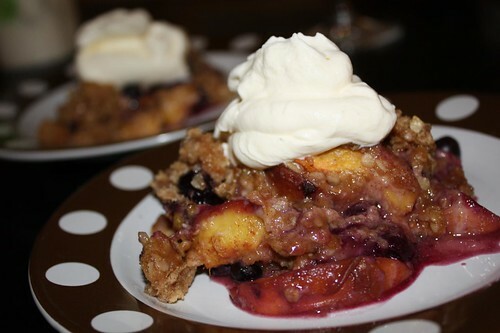 Jen made a peach and blueberry crisp for dessert. I made the whipped cream. Jen ridiculed me for purchasing this bottle. I saw this bottle at the store and had an amazing idea to use it for making whipped cream. Jen feels strongly that this type of device is tailor made for making fools like me make an ill-advised purchase. But check out how awesome it is! It's got this little wire ball in it. 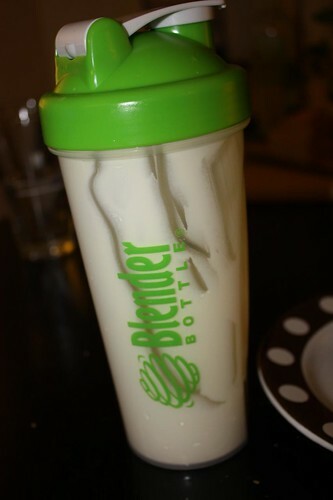 It's supposed to be used to make shakes and stuff for people that make protein drinks -- body builders and the like. 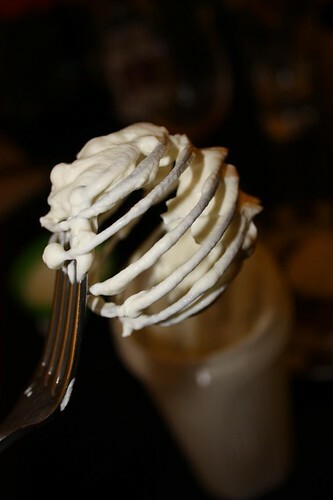 But I had the magnificent idea to harness that whisking power to make whipped cream. And let me just say that it worked fabulously. It's outside of the box thinking like this that makes me one of the world's foremost culinary innovators.